For the medium tank, see M3 Lee. The M3 Stuart, officially Light Tank, M3, was an American light tank of World War II. It was supplied to British and other Commonwealth forces under lend-lease prior to the entry of the U.S. into the war. Thereafter, it was used by U.S. and Allied forces until the end of the war. 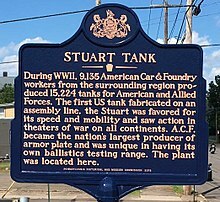 The British service name "Stuart" came from the American Civil War Confederate general J. E. B. Stuart and was used for both the M3 and the derivative M5 Light Tank. In U.S. use, the tanks were officially known as "Light Tank M3" and "Light Tank M5". The Stuart was also the light tank counterpart of the M3 Lee, which was a medium tank. Observing events in Europe, American tank designers realized that the Light Tank M2 was becoming obsolete and set about improving it. The upgraded design, with thicker armor, modified suspension and new gun recoil system was called "Light Tank M3". Production of the vehicle started in March 1941 and continued until October 1943. Like its direct predecessor, the M2A4, the M3 was initially armed with a 37 mm M5 gun and five .30-06 Browning M1919A4 machine guns: coaxial with the gun, on top of the turret in an M20 anti-aircraft mount, in a ball mount in right bow, and in the right and left hull sponsons. Later, the gun was replaced with the slightly longer M6, and the sponson machine guns were removed. For a light tank, the Stuart was fairly heavily armored. It had 38 mm of armor on the upper front hull, 44 mm on the lower front hull, 51 mm on the gun mantlet, 38 mm on the turret sides, 25 mm on the hull sides, and 25 mm on the hull rear. The M3 and M3A1 variants were powered by an air-cooled radial engine, either a gasoline-fueled 7-cylinder Continental W-670 (8,936 built) or a 9-cylinder Guiberson T-1020 diesel (1,496 built). Both of these powerplants were originally developed as aircraft engines. Internally, the radial engine was at the rear and the transmission at the front of the tank's hull. The propeller shaft connecting the engine and transmission ran through the middle of the fighting compartment. The radial engine's crankshaft was positioned high off the hull bottom and contributed to the tank's relatively tall profile. When a revolving turret floor was introduced in the M3 hybrid and M3A1, the crew had less room. A further 3,427 M3A3 variants were built with modified hull (similar to the M5), new turret and the Continental W-670 gasoline engine. In contrast to the M2A4, all M3/M5 series tanks had a trailing rear idler wheel for increased ground contact. To relieve wartime demand for the radial aero-engines used in the M3, a new version was developed using twin Cadillac V8 automobile engines and twin Hydra-Matic transmissions operating through a transfer case. This version of the tank was quieter, cooler and roomier; the automatic transmission also simplified crew training. The new model (initially called M4 but redesignated M5 to avoid confusion with the M4 Sherman) featured a redesigned hull with a raised rear deck over the engine compartment, sloped glacis plate and driver's hatches moved to the top. Although the main criticism from units using the Stuarts was that it lacked firepower, the improved M5 series kept the same 37 mm gun. The M5 gradually replaced the M3 in production from 1942 and, after the M7 project proved unsatisfactory, was succeeded by the Light Tank M24 in 1944. Total M5 and M5A1 tank production was 8,885; an additional 1,778 M8 75 mm howitzer motor carriages based on the M5 chassis with an open-top turret were produced. (It) is apparent that a Light Tank Battalion, armed with only 37mm guns, unless very skillfully employed with Infantry, will suffer severe casualties in men and material. The Light Tank still has to depend on speed, maneuver, and selection of suitable targets if it is to be of very much use. In spite of the fact that the training of this Battalion was not pointed toward reconnaissance lines, we have been able to accomplish our missions with a Cavalry Reconnaissance Group with a much greater degree of success than in any other assignment to date. 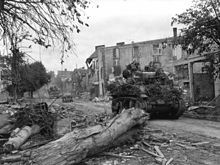 Light Tank M5A1 passes through the wrecked streets of Coutances. An Australian Stuart I during the final assault on Buna. A British M3 (Stuart I) knocked out during fighting in North Africa. British and other Commonwealth armies were the first to use the Light Tank M3, as the "General Stuart", in combat. From mid-November 1941 to the end of the year, about 170 Stuarts (in a total force of over 700 tanks) took part in Operation Crusader during the North Africa Campaign, with poor results. This is despite the fact that the M3 was superior or comparable in most regards to most of the tanks used by the Axis forces. The most numerous German tank, the Panzer III Ausf G, had nearly identical armor and speed to the M3 [note 1], and both tanks' guns could penetrate the other tank's front armor from beyond 1,000 m (3,300 ft). The most numerous Italian tank (and second most numerous Axis tank overall), the Fiat M13/40, was much slower than the Stuart, had slightly weaker armor all around, and could not penetrate the Stuart's front hull or turret armor at 1,000 meters, whereas the Stuart's gun could penetrate any spot on the M13/40. Although the high losses suffered by Stuart-equipped units during the operation had more to do with the better tactics and training of the Afrika Korps than the apparent superiority of German armored fighting vehicles used in the North African campaign, the operation revealed that the M3 had several technical faults. Mentioned in the British complaints were the 37 mm M5 gun and poor internal layout. The two-man turret crew was a significant weakness, and some British units tried to fight with three-man turret crews. The Stuart also had a limited range, which was a severe problem in the highly mobile desert warfare as units often outpaced their supplies and were stranded when they ran out of fuel. On the positive side, crews liked its relatively high speed and mechanical reliability, especially compared to the Crusader tank, which comprised a large portion of the British tank force in Africa up until 1942. The Crusader had similar armament and armor to the Stuart while being slower, less reliable, and several tons heavier. The Stuart also had the advantage of a gun that could deliver high-explosive shells; HE shells were not available for the QF 2 pdr mounted by most Crusaders, severely limiting their use against emplaced anti-tank guns or infantry;[note 2]. The main drawback of the Stuart was its low fuel capacity and range; its operational range was only 75 miles (cross country), roughly half that of the Crusader. In the summer of 1942, the British usually kept Stuarts out of tank-to-tank combat, using them primarily for reconnaissance. The turret was removed from some examples to save weight and improve speed and range. These became known as "Stuart Recce". Some others were converted to armored personnel carriers known as the "Stuart Kangaroo", and some were converted into command vehicles and known as "Stuart Command". M3s, M3A3s, and M5s continued in British service until the end of the war, but British units had a smaller proportion of these light tanks than U.S. units. The other major Lend-Lease recipient of the M3, the Soviet Union, was less happy with the tank, considering it under-gunned, under-armored, likely to catch fire, and too sensitive to fuel quality. The M3's radial aircraft engine required high-octane fuel, which complicated Soviet logistics as most of their tanks used diesel or low-octane fuel. High fuel consumption led to a poor range characteristic, especially sensitive for use as a reconnaissance vehicle. Also, compared to Soviet tanks, the M3's narrower tracks resulted in a higher ground pressure, getting them more easily stuck in the spring and autumn mud and winter snow conditions on the Eastern Front. In 1943, the Red Army tried out the M5 and decided that the upgraded design was not much better than the M3. Being less desperate than in 1941, the Soviets turned down an American offer to supply the M5. M3s continued in Red Army service at least until 1944. 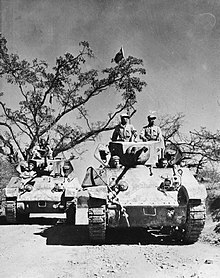 With the IJA's drive toward India within the South-East Asian theatre of World War II, the United Kingdom hastily withdrew their 2nd Royal Tank Regiment and 7th Hussars Stuart tank units (which also contained some M2A4 light tanks) from North Africa, and deployed them against the Japanese 14th Tank Regiment. By the time the Japanese had been stopped at Imphal, only one British Stuart remained operational. When the U.S. entered the war in 1941, it began to supply China with AFVs, including M3 Stuarts, and later M4 Sherman medium tanks and M18 Hellcat tank destroyers, which trickled in through Burma. 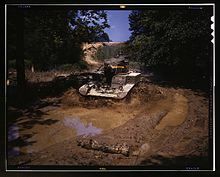 Although the U.S. light tanks had proven effective in jungle warfare, by late 1943, U.S. Marine Corps tank battalions were transitioning from their M3/M5 light tanks to M4 medium tanks, mostly for the much greater high-explosive blast effect of the M4's 75mm gun, which fired a much larger shell with a heavier explosive payload. In Europe, Allied light tanks had to be given cavalry and infantry fire support roles since their main cannon armament could not compete with heavier enemy armored fighting vehicles. However, the Stuart was still effective in combat in the Pacific Theater, as Japanese tanks were both relatively rare and were lighter in armor than even Allied light tanks. Japanese infantrymen were not well equipped with anti-tank weapons, and as such had to use close assault tactics. In this environment, the Stuart was only moderately more vulnerable than medium tanks. Though the Stuart was to be completely replaced by the newer M24 Chaffee, the number of M3s/M5s produced was so great (over 25,000 including the 75mm HMC M8) that the tank remained in service until the end of the war, and well after. 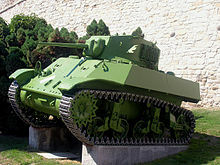 In addition to the U.S, UK and Soviet Union, who were the primary users, it was also used by France (M3A3 and M5A1), China (M3A3s and, immediately post-war, M5A1s) and Josip Broz Tito's Partisans in Yugoslavia (M3A3s and few M3A1). 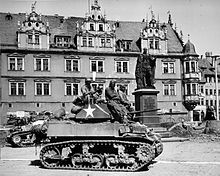 On 9 December 1944, the 759th Tank Battalion advanced on a hill near Bogheim but was subjected to a counter-attack by German forces, including a heavy self-propelled assault gun, which took "over 100 direct hits" at ranges as low as 75 yd (69 m) with "no appreciable damage". M3A3 in Chinese Civil War, 1949. ROC M5A1 tank with placard reading "The Bear of Kinmen". After the war, some countries chose to equip their armies with cheap and reliable war surplus Stuarts. The Chinese Nationalist Army having suffered great attrition as a result of the ensuing civil war, rebuilt their armored forces by acquiring surplus vehicles left behind in the Philippines by the U.S. forces, including 21 M5A1s to equip two tank companies. They would have their finest hours during the Battle of Kuningtou in 1949, for which the tanks came to be known as the "Bear of Kinmen" (金門之熊). The M5 played a significant role in the First Kashmir War (1947) between India and Pakistan, including the battle of Zoji-la pass fought at an elevation of nearly 12,000 ft.
M3A3s were used by British forces in Indonesia during the Indonesian National Revolution, where they suffered heavy losses due to the Stuart's thin armour plating. They were used until 1946, when the British left. The M3A3s were then passed on to the KNIL, which used them until the end of the fighting before passing on the tanks to the Indonesian National Army. The tank saw action during the DI/TII rebellions in Aceh and Java, RMS rebellions in South Maluku, PRRI rebellions in Sumatra, Permesta rebellions in Northern Sulawesi and the fighting against the 30 September movement. During the four-day long Football War of 1969, El Salvador invaded Honduras in a all-out-war strike using the M3 Stuart as the main battle tank. El Salvador captured eight major cities before the Organization of American States arranged a ceasefire. The M3 Stuart tanks of the Paraguayan Army during the Independence day parade, 15 May 2002 in Asuncion. The M3 Stuart is still on the active list in the Armed Forces of Paraguay, with ten of the tanks being overhauled in 2014 to provide a training capability. Light Tank M3 in Fort Knox, 1942. Light Tank M3A1 in Yad la-Shiryon Museum, Israel. Light Tank M3A3 at the Belgrade Military Museum, Serbia. Early production Light Tank M5A1 at Worthington Tank Museum. 75mm Howitzer Motor Carriage M8 on display at the Musée des Blindés. 1,285 M3s had Guiberson diesel installed and were called "Stuart II" by British. Late production M3s were fitted with turret developed for M3A1, though without turret basket. These tanks were dubbed "Stuart Hybrid". 4,621 were produced from May 1942 to February 1943. New turret with turret basket and no cupola. Gun vertical stabilizer installed. Sponson machine guns were removed. 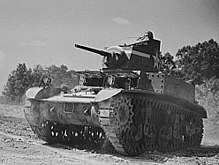 M3A1s with Guiberson diesel were called "Stuart IV" by British. Put into production to integrate hull improvements brought by the M5 into the M3 series. Turret with rear overhang to house SCR-508 radio. Welded hull with sloped armor, 20° in from the vertical, on front and sides. Twin Cadillac engines. Redesigned hull similar to M3A3, but with vertical sides and raised engine deck. Turret as for M3A1. M5 with the turret of the M3A3; this was the major variant in US units by 1943. Based on M5 chassis. The gun was replaced with the 75 mm M2/M3 howitzer in open turret and a trailer hook was fitted so an ammunition trailer could be towed. Provided fire support to cavalry reconnaissance squadrons. M8 HMC variant based on M5A1 chassis. Self-propelled gun based on M3 chassis. 75 mm M1A1 pack howitzer was mounted in a boxy superstructure. The project started in September 1941 and was abandoned in April 1942. Only two were produced, 75 mm Howitzer Motor Carriage M8 was chosen to be produced instead. Self-propelled 105 mm howitzer based on M5A1 chassis. Development began in 1943. Two prototypes built and tested in August 1944 at Aberdeen Proving Grounds. Project was discontinued on June 21, 1945. Self-propelled gun based on M3A3 chassis. The engine was moved to the middle of the hull and a 3-inch gun was mounted in a superstructure in the rear. The project started in September 1942 and was abandoned in February 1943. Variant of T56 with Continental engine of the Medium Tank M3. Also dropped in February 1943. M5A1 with turret replaced by superstructure in which an 81 mm mortar was installed. Also carried .50 cal Browning M2HB machine gun. The project was abandoned in April 1944 because of inadequate crew and storage space. Design similar to T27, with 4.2 inch (107 mm) mortar. Was abandoned for the same reason. M5A1-based 4.2 inch (107 mm) chemical mortar carrier. Anti-aircraft variant developed in 1942. Was armed with four .50 cal. machine guns in a turret developed by Maxson Corp. The project was rejected because of the availability of the M16 MGMC. Anti-aircraft vehicle based on lengthened M5A1 with Bofors 40 mm gun. Developed into M19 Multiple Gun Motor Carriage on Light Tank M24 chassis. Anti-aircraft vehicle based on same chassis as T65 (M5A1). Was armed with quad Oerlikon 20 mm cannons. M3/M5 with turret replaced by small superstructure with a .50 cal. machine gun. Developed in 1942, was rejected. Ronson flamethrower installed instead of the main gun. 20 tanks were converted for US Marine Corps in 1943. Flame thrower was installed instead of the hull machine gun. M5 with dozer blade. Turret was usually removed. T39 launcher with 20 7.2" rockets mounted on the top of the turret. Never reached production. Flame thrower was installed instead of the main gun. Turret replaced by boxy superstructure with flame thrower in a smaller turret. Prototype only. Reconnaissance vehicle based on turretless Stuart. Stuart Kangaroo with extra radios. Another turretless variant similar in appearance to the Recce and Kangaroo. Used to tow the Ordnance QF 17 pounder. Not to be confused with the US M5 Tractor. In the 1970s, the Brazilian company Bernardini developed a series of radical Stuart upgrades for the Brazilian Army. Based on M3A1, this design had new engine (280 hp (210 kW) Saab-Scania diesel), improved suspension, new upper hull armor, fire controls and DEFA 90 mm gun in a new turret. 80 vehicles were produced. An X1A with improved suspension with three bogies (instead of two) each side and raised idler. Based on the X1A1, this version retained almost nothing of the original Stuart as even its hull was redesigned. The vehicle weighed 19 short tons (17 t), had crew of 3, was armed with 90 mm gun and powered by Saab-Scania 300 hp (220 kW) diesel. 30 vehicles were produced in 1979–1983. Various national operators of the Stuart tank. A row of captured M3 Stuart tanks of the Imperial Japanese Army (IJA). Most of the IJA's M3 Stuarts were captured either in the US-controlled Philippines or in British Burma in WWII. An M5A1 Stuart used by the Republic of China Armed Forces is referred to locally as "The Bear of Kinmen" (Chinese: 金門之熊) because of its outstanding performance against the Chinese People's Liberation Army (PLA) during the Battle of Guningtou following the Chinese Civil War and the exit of the Nationalist forces to Taiwan. A former Rhodesian Army Stuart tank on display at the Zimbabwe Military Museum in the city of Gweru. Canada - Stuart V (M3A3) tanks were widely used in recce troop of armoured regiments. In 2 Canadian Armoured Brigade after the Normandy landings, the establishment for each regiment was 49 Sherman tanks, both 75mm and 17pdr, and up to 9 Stuart tanks. Japan - Operated captured vehicles, for example in the Philippines and at the Battle of Imphal. New Zealand The M3A1 was supplied in 1941-42 (89) and some were used in the Pacific. They were withdrawn in 1953-55. Nicaragua — four M3A1 were used by National Guard from the mid 1940s to 1979. Turkey - 210 British M3s received from 1942 to 1944. Soviet Union - 1,676 M3 series tanks received as part of Lend-Lease, and 5 M5. The 1941 US military propaganda short film The Tanks Are Coming features the M3 and its manufacturing process. The 1945 Mexican film comedy "Un día con el diablo" (A Day with the devil) uses several Mexican Army M3s. Modified Stuarts were used in the movie Attack! as German tanks. An M3 was the center piece of The Green Hornet episode "Seek, Stalk, & Destroy". A "24k gold" M3 was created from gold bullion in the Batman episode "Penguin's Disastrous End". It was stopped with the "Batzooka". Season 5 of the TV series The Twilight Zone had an episode "The 7th Is Made Up of Phantoms" featuring an M3 Stuart and its crew going back in time to the Battle of Little Big Horn. "Haunted Tank" was a DC Comics feature that appeared in G.I. Combat starring an M3 Stuart. It ran from 1961 to 1987. A heavily modified M5A1 Stuart was featured in the movie Tank Girl as the eponymous heroine's tank. A M5A1 Stuart tank was featured in the James Bond movie Licence to Kill. The tank opens fire on the Chinese hideout in the fictional country Isthmus, and saves Bond. The Ontario Regiment Museum has an operational M3 Stuart. ^ TM-9-732-M5-Manual, p. § 6. ^ Fletcher, David (1989). The Great Tank Scandal: British Armour in the Second World War - Part 1. HMSO. ISBN 978-0-11-290460-1. ^ "T/O&E 17-25 Tank Battalion (18 November 1944)" (PDF). Retrieved 18 June 2016. ^ "After action report, 759th Light Tank Battalion, July 44 through March 45". 4 May 1945. p. 27. Retrieved 19 June 2017. ^ Zaloga, Steven J. (2004). US Armored Divisions - The European Theater of Operations, 1944-45. Battle Orders. 3. Osprey. p. 34. ISBN 978-1-84176-564-8. ^ 李福井，(Battle of Kuningtou)，Ricefield Publication (1999; ISBN 957-8332-90-4), pp.68-69. ^ Padi, Mata. "M3A3 Stuart: Light Tank Legendaris Yang Masih Punya "Gigi"". Facebook (in Indonesian). Facebook.com. Retrieved 7 January 2016. ^ "M3A3 Stuart: Light Tank Legendaris Yang Masih Punya "Gigi"". Indomiliter/. Indomiliter.com. Retrieved 7 January 2016. ^ Manuel A. Ribeiro Rodrigues, The Overseas Campaigns 1961–1974 – Guinea-Angola-Mozambique – Army (I), Edições Destarte Lda., Lisbon 2000 (Bi-lingual edition) ISBN 972-8496-14-1, pp. 53–55. ^ "Lesakeng". South African Armour Museum. 2012-12-06. Archived from the original on 2013-07-03. Retrieved 2013-06-18. ^ de Cherisey, Erwan (29 December 2015). "Paraguay keeping M3 Stuart, M4 Sherman tanks in service". IHS Jane's Defence Weekly. Archived from the original on 2 January 2016. Retrieved 2 January 2016. ^ a b c d e Thers, Alexandre (February 2013). "Le Blindorama: La Yougoslavie, 1930 - 1945". Batailles & Blindés (in French). No. 53. Caraktère. pp. 4–7. ISSN 1765-0828. ^ a b de Cherisey, Erwan (29 December 2015). "Paraguay keeping M3 Stuart, M4 Sherman tanks in service". IHS Jane's Defence Weekly. Retrieved 2 January 2016. ^ Handel, Paul. 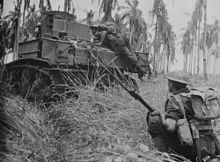 "M3 Stuart Light Tanks In Action In New Guinea". Retrieved July 5, 2018. ^ Plowman, Jeffrey (1985). Armoured Fighting Vehicles of New Zealand 1939-59. Christchurch: JEP Publications. p. 132. ^ Magnuski, Janusz (1996). Wozy bojowe PSZ 1940-1946 (in Polish) (I ed.). Warszawa: Wydawnictwo Lampart. pp. 44–49. ISBN 83-86776-39-0. Hunnicutt, R. P. Stuart, A History of the American Light Tank. Vol. 1; 1992, Presidio Press. ISBN 0-89141-462-2. Zaloga, Steven (1999). M3 & M5 Stuart Light Tank. New Vanguard 33. Osprey Publishing. ISBN 978-1-85532-911-9. Zaloga, Steven (2007). Japanese Tanks 1939–45. New Vanguard 137. Osprey Publishing. ISBN 978-1-84603-091-8. Zaloga, Steven. Armored Thunderbolt, The US Army Sherman in World War II. 2008; Stackpole Books. ISBN 978-0-8117-0424-3. Wikimedia Commons has media related to Stuart tank. "TM 9-732 M5 Stuart Light Tank Operating Manual". Archived from the original on 2012-11-02. This page was last edited on 7 March 2019, at 13:34 (UTC).